Voting has closed and you chose blue with gray by 56 to 44 percent. Scroll down to vote, to see screen shots of final head-to-head choices, and to view results of previous polls. Your comments and votes regarding the color choices for the official Poker1 opening have been very useful. Thank you! You have chosen the "shades of blue" design. However there were numerous comments that — taken in bulk — seem to indicate it might be "too blue." Maybe not. In any case, it's time for you and me to make a final decision and move on. I've designed one last alternative, called "blue with gray." Is this final already? Haven’t visited for a while. I like the all-gray color. 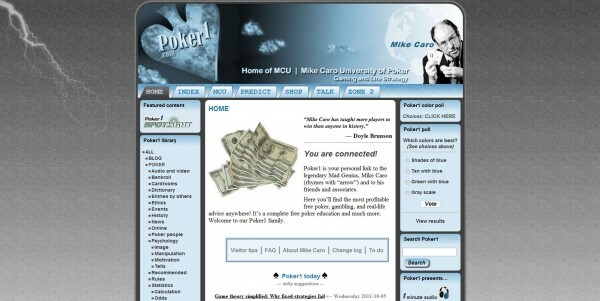 Blue is too common, just as white and black themed sites are. But where do you see a gray website? Very few and Poker1 was one of the few I remember having it. I tried to vote for blue w/ gray, but it wouldn’t let me. If you’ve already voted, you won’t be able to vote again. You’ll only see the results. If there’s a different issue, please tell me which browser you were using when it occurred.